Just because a way is marked, it doesn’t mean that following it is necessary easy, or that progress can be rapid, or even regular. In my last blog we ventured out along the Burren Way and considered the first Chapter of the Tao Te Ching, sometimes, in spite of all our procrastination, starting can be the easy bit – keeping going is the challenge. 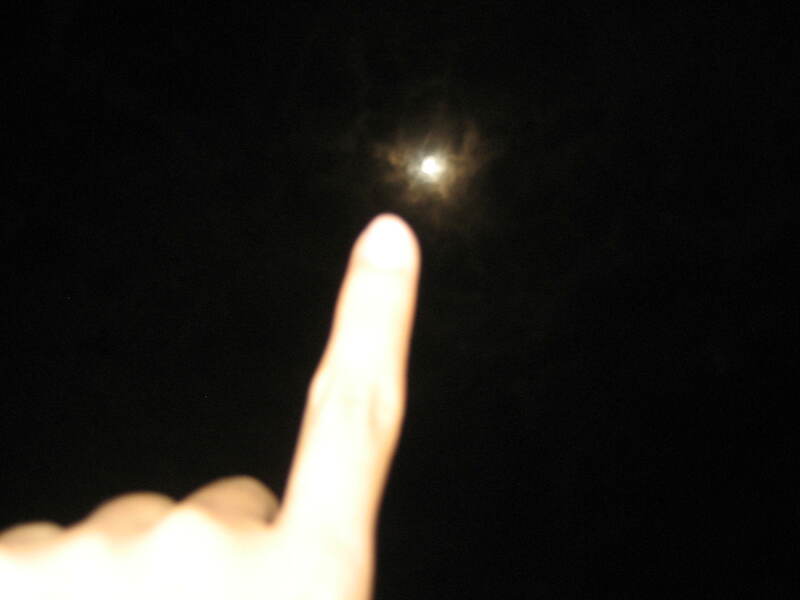 Spiritual leaders have to be blabbermouths, Mitchell concludes and reminds us of the Buddhist metaphor, “Their words are fingers pointing to the moon, if you watch the fingers, you can’t see the moon”. 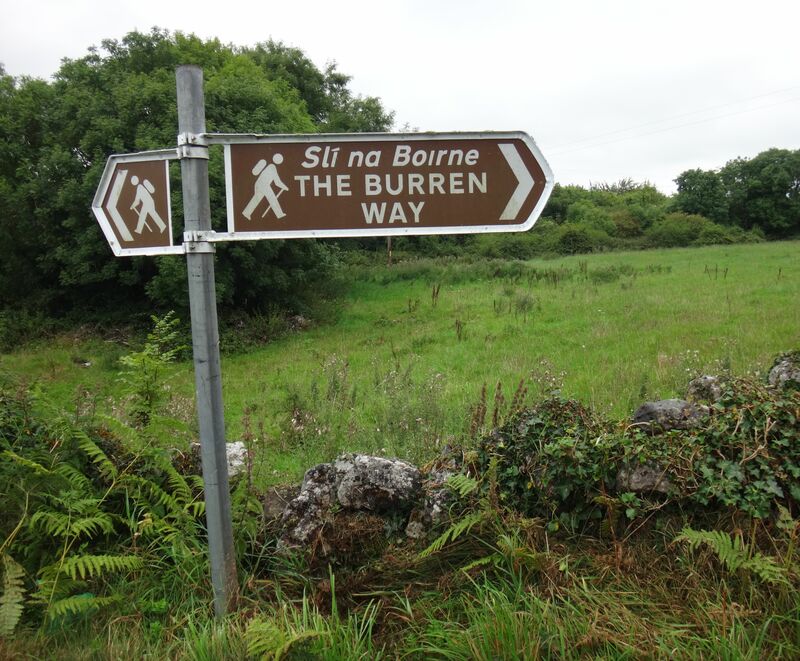 I walked about 125 km along the Burren Way, about 25 km per day, with a couple of detours along the route. 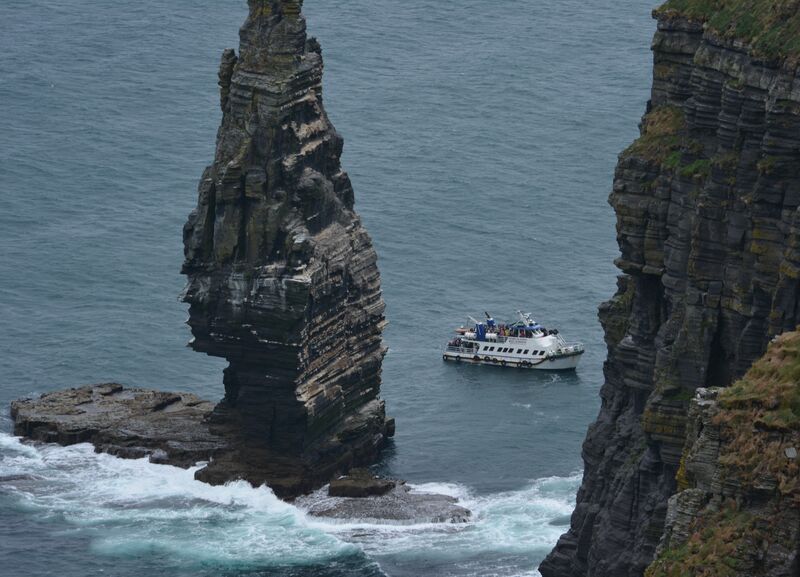 Life’s like that, including my first ever visit to the Aran Islands in Galway Bay. Yes we have already established that i’m a slow starter and if it wasn’t for my mid-life crisis and a host of unpleasant events, i might never have gone anywhere – if that’s not a double negative. In the words of Seasick Steve, “I started out with Nothin and I still got most of it left”. I took the ferry from Doolin pier to Inis Oirr – the smallest of the three Aran Islands. Start small my father always advised me. 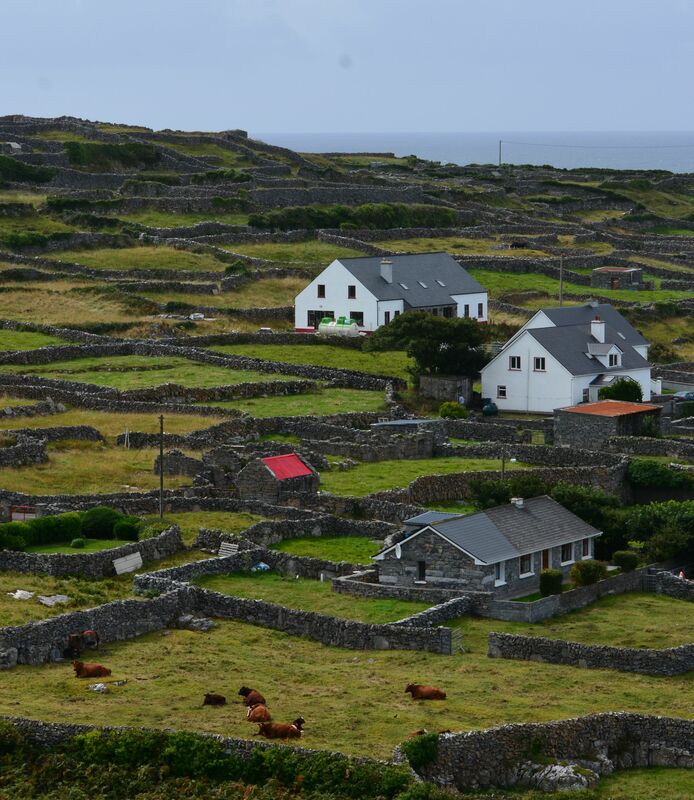 A beautiful landscape of tiny fields, nestled houses, bare rocks and sea. A rough sea as it turned out on the day – i had more than one reason to be thinking of Seasick Steve. Such beauty. My final day involved walking along the Cliffs of Moher – truly awesome beauty. One of my favorite views was when i was just 215 metres from the shoreline, 214 metres up and 1 metre in. While the landscape, the geology, the views and the archaeology all contributed to the beauty of the journey, it is the people you meet who make it special. Is beauty in the eye of the beholder or is it intrinsic? Does an object only appear beautiful if we compare it with something ugly? One of Red Pine’s commentators, Lu Hsi-Sheng says, “What we call beautiful or ugly depends on our feelings. Nothing is necessarily beautiful or ugly until feelings make it so. But while feelings differ, they all come from our nature, and we all have the same nature”. Not all people consider the same things beautiful so beauty must be in the eye of the beholder, even if many, many beholders have the same opinion, find the same things beautiful. It is true, also, that we often don’t see clearly much of the world we live in and don’t recognize its beauty until one fine day when all is well internally, within ourselves, and we are at peace. On such a day we are likely to acclaim the beauty of our street, a tree in our neighbor’s garden, the appearance of a stone in our front wall. On such a day we are thankful for the beauty of our world but we often fail to be thankful for the ability to perceive that beauty. On very special days we might realise that the recently admired stone in the front wall is always beautiful, that we would always see the world and its contents as beautiful if we were always at peace, if we were always perfectly present. And then our mind wanders off again …………………………..
That’s one of the beauties, there we go again, of walking; you slow down and see so much more and seeing it you recognize its beauty. Perhaps that’s the answer; everything is beautiful but our feelings make us see some things as beautiful and some things as ugly. Back to the people we meet – all beautiful when we are at peace. Many encounters are only brief, and remind me of the chess move, en passant. We capture something in passing, often something magical, something that stays with us for many a day, something valuable. Because we have left so much of ourselves and our lives behind us when we are walking, for the duration of the Way at least, it is easier to connect, to experience a level in other people that is often more obscured in everyday life. I have always, since school at least which is pretty much ‘always’ to me at this stage in my life, admired the Latin word for luggage, ‘impedimenta’, baggage, things which impede our progress, or as the Romans were principally concerned, things which slowed down the advance of their armies. Our life’s baggage, accumulated over the decades, certainly often impedes our Way. We spoke about that in my last blog, “1452 – THE WAY, TAO TE CHING – by Lao Tzu”; the road to wisdom, to enlightenment, involves giving things up – a process ultimately forced upon us by age or ill health. One of the reasons why i walk the Ways is to free my mind, to sink into my true self, to renounce much of my impedimenta for a short while and to connect with my true purpose. Detachment, freedom, peace and the recognition of beauty everywhere and always.